Roberto Henschel studied Mathematics with a minor in Computer Science at the Freie Universität Berlin. He received his Dipl.-Math. degree from the Freie Universität Berlin in March 2012. His diploma thesis "Lattice Theoretic Implications on Chromatic Polynomials and Relations to Geometry" dealt with computing chromatic polynomials by applying Ehrhart theory. In 2012-2013 he had been working at 'Fachbereich Mathematik' at the TU Darmstadt as a research assistant. Since then he has been working as a research assistant toward a PhD degree at the 'Institut für Informationverarbeitung' at the Leibniz University of Hannover. His research interests include multiple people tracking and graph algorithms. Student positions (HiWi,bachelor and master’s thesis) are available as part of the project Multiple People Tracking . If you are interested in any of these position, please do not hesitate to contact me. 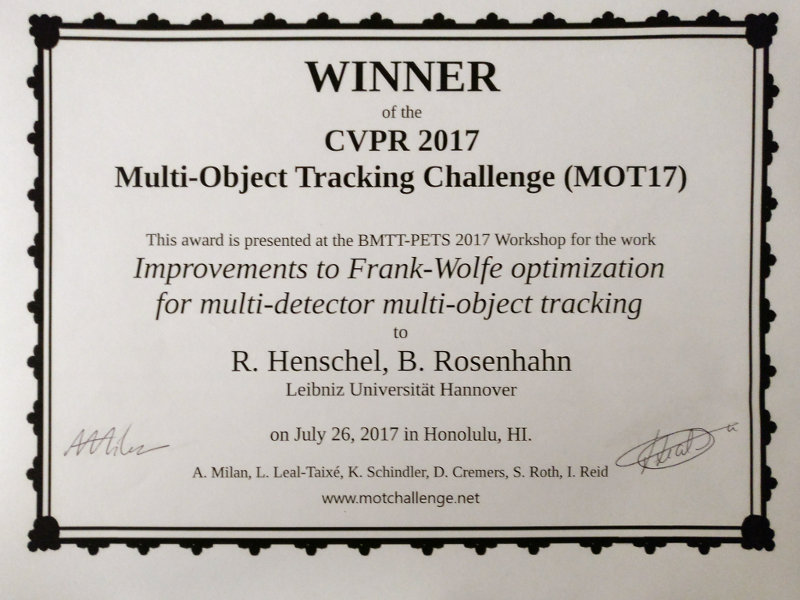 Unser Ansatz Improvements to Frank-Wolfe optimization for multi-detector multi-object tracking ist der Gewinner in der CVPR 2017 Challenge, Multiple Object Tracking (MOT17) des 1st Joint BMTT-PETS Workshop on Tracking and Surveillance . 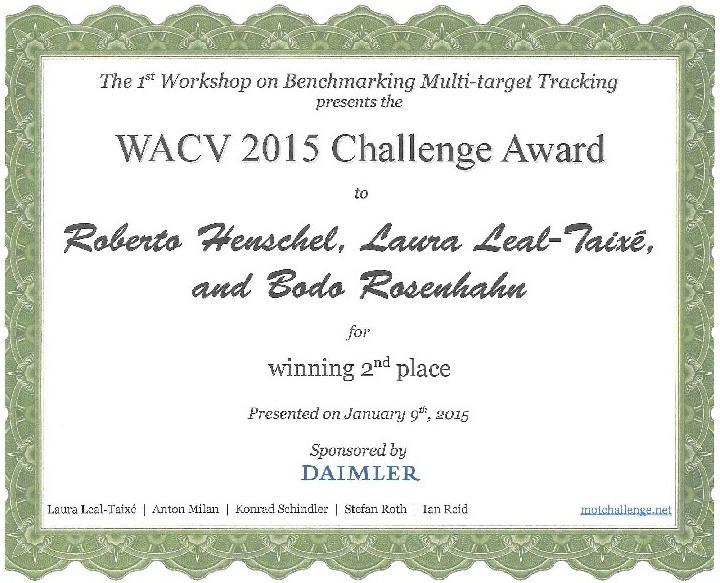 Unser Paper Solving Multiple People Tracking In A Minimum Cost Arborescence erreichte den 2ten Platz in der WACV 2015 Challenge des 1st Workshop on Benchmarking Multi-target Tracking.